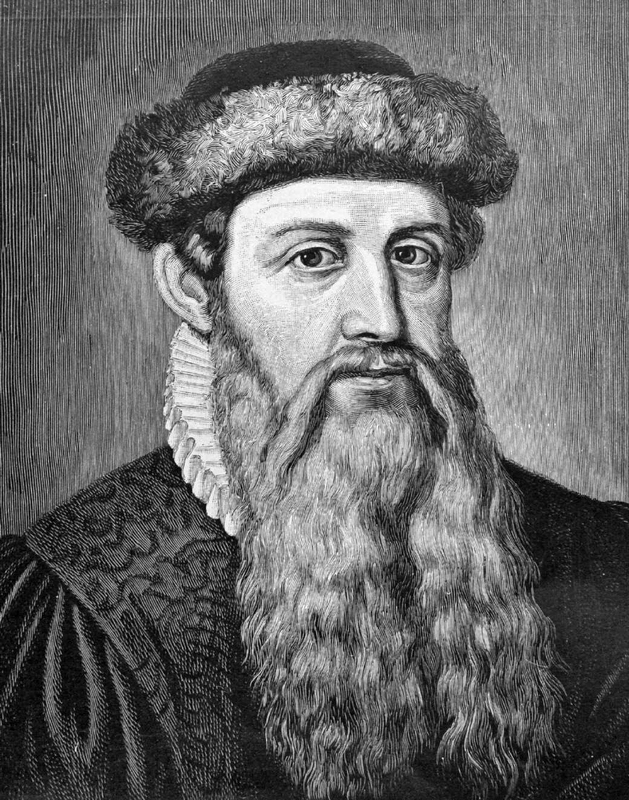 The exact date that Johannes Gutenberg published his first book - The Bible - isn't clear, although some historians believe the first section was published on September 30, 1452. The completed book - according to the Library of Congress - may have been released around 1455 or 1456. What is for sure is that Gutenberg's work, published on his printing press, changed the world. For the first time, books could be "mass produced" instead of "hand copied." It is believed that 48 originals, in various states of repair, still exist. The British Library has two copies - one printed on paper, the other on vellum (from the French word Vélin, meaning calf's skin) - and they can be viewed and compared online. The mass printing of identical texts, which hadn't really been possible before Gutenberg, greatly facilitated the spread of knowledge. Over a period of several hundred years, language - spelling and grammar - was gradually codified. Literacy rates went up. More and more people were reading the same texts and discussing or debating the same ideas. This improvement in communication was one of the most important outcomes of printing ... NYPL is very much about the democratization of knowledge. The Bible epitomizes that ideal, which is to spread the power of learning, to empower people to learn. Korea was the first place where a movable-type system was invented which could be used for large-scale printing (because it was made of metal instead of porcelain). This took place in about 1230 (during the Goryeo Dynasty). The oldest still-existing book, printed from this Korean system, is a compilation of Buddhist teachings known as Jikji. That abbreviation stands for "Anthology of Great Buddhist Priests' Zen Teachings." This book - reportedly published in July of 1377 - is thus the oldest example of a work published with metal movable type. The image, at the top of this page, depicts an artist's visualization of Gutenberg, at work in his printing shop. Click on the picture for a full-page view. Image, based on a 19th-century steel engraving, online courtesy Wikimedia Commons. Bos, Carole "Gutenberg Publishes the World's First Printed Book" AwesomeStories.com. May 06, 2014. Apr 21, 2019.